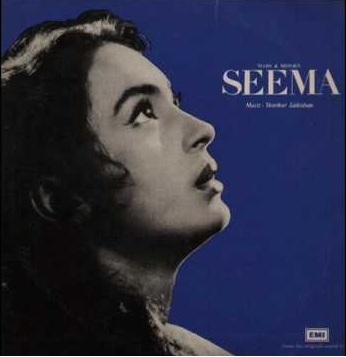 Seema was directed by Amiya Chakrabarty and released in 1955. It was the 8th highest grossing film of that year. From 1941 to 1957 Amiya Chakrabarty directed a total of 14 feature films. Most of the films including Seema were social melodramas. Chakrabarty’s training came about during his time at Bombay Talkies and then later Filmistan where he enjoyed commercial success. Chakrabarty was a filmmaker who seemed to evolve with each film and had his life not been cut short so unexpectedly then perhaps his contribution to the development of the Hindi melodrama might be more widely discussed in critical discourse. Seema is one of Chakrabarty’s most interesting films in terms of the Hindi melodrama. The story is centred on the character of Gauri (Nutan) – a young woman who is wrongly accused of theft and criminalised by the state. Gauri has lost her parents and she is alone in the world. The film opens in a refugee camp (a bustee) and although Chakrabarty does not explicitly state any political or historical context it seems likely that Gauri is a victim of partition. Given Chakrabarty’s Bengali roots and the fact that he was forced to leave Bengal in 1935 due to his political activism, Gauri is an exile and the loss of her parents makes her character similar to Nita in Meghe Dhaka Tara (The Cloud Capped Star, 1960). Actually, in many ways, Gauri acts as a precursor to Nita but a major difference exists between the two; Nita is part of a family and sacrifices her own ambitions whereas Gauri’s victimisation by those around her leads to rebel and openly defy the laws of social oppression. Once the police fail to contain Gauri’s defiance, a shelter for abused women run by Ashok (Balraj Sahni) take her in and offer the promise of social reformation. 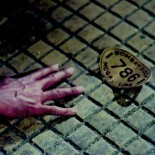 The first half of the film in which Gauri’s victimisation is the main focus of the narrative is by far the strongest. In terms of ideological investigation, the first half boldly asserts that social forces cultivate Gauri’s destructive nature and her repeated questioning of authority presents her as both a figure of patriarchal oppression but also someone searching for an identity obliterated by partition. The final third sees Gauri and Ashok falling in love and although Gauri is predictably reformed (thus transforming Seema into a conventional melodram; only on the surface though), Chakrabarty opts for a muted ending. It is an ending that promises very little in terms of hope for Gauri and Ashok, and may even hint at an exclusion from society. What a film like Seema illustrates quite brilliantly is that the Hindi melodrama by the 1950s was taking on a growing ideological sophistication and offering directors the perfect vehicle for exploring the lives of ordinary Indian women. Chakrabarty’s job was made a lot easier though by the added presence of Nutan who as the tortured Gauri delivers one of her best performances. Hi, your review intrested me, for instance in your link between Gauri and Nita in The cloud-capped star, and even if you speak of one of Nutan's “best performances” without giving other examples, you have hit right. It was her first greatest performance. This entry was posted on October 29, 2011 by Omar Ahmed in 1950s, Indian CInema, Melodrama, Nutan, Partition.